Since century XVI itinerant italian artists painted sacred images in front of the churches trying to capture the attention of people trough their expressing pictures. 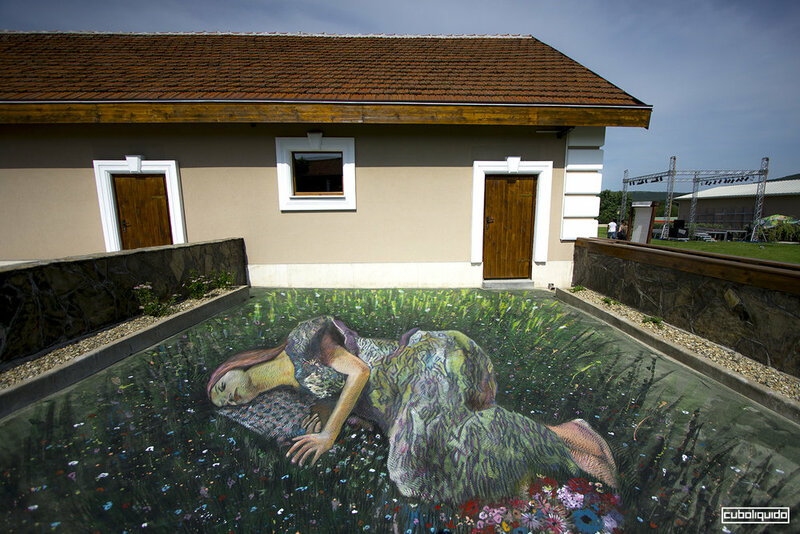 The tecnique of chalk and pastels on pavement makes even now this kind of Art ephemeral cause the artworks fade out at first rain and wind. That’s why only after the birth of photography we could have a visual documentation of that ancient tradition and way of life. The revival of the madonnari Art after the second world war brought also in Italy and abroad the launch of events related to the italian street painting tecnique. 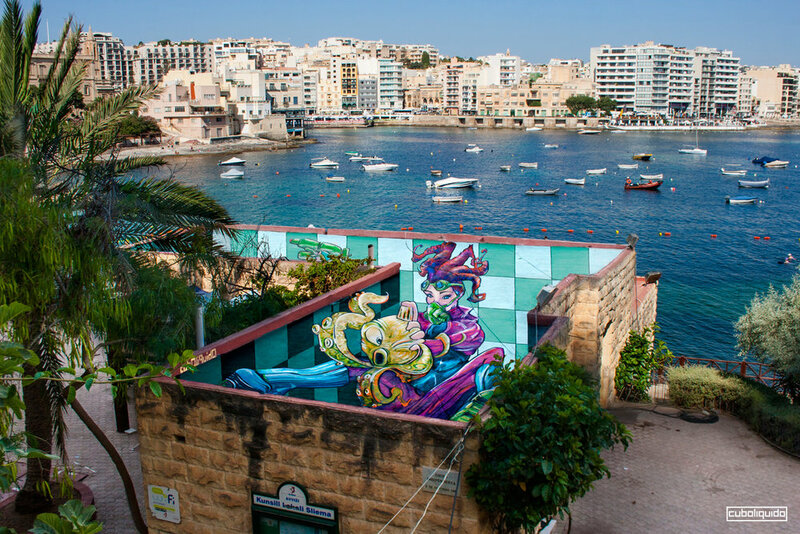 In the early 80s some street artists, inspired by XVII cent. 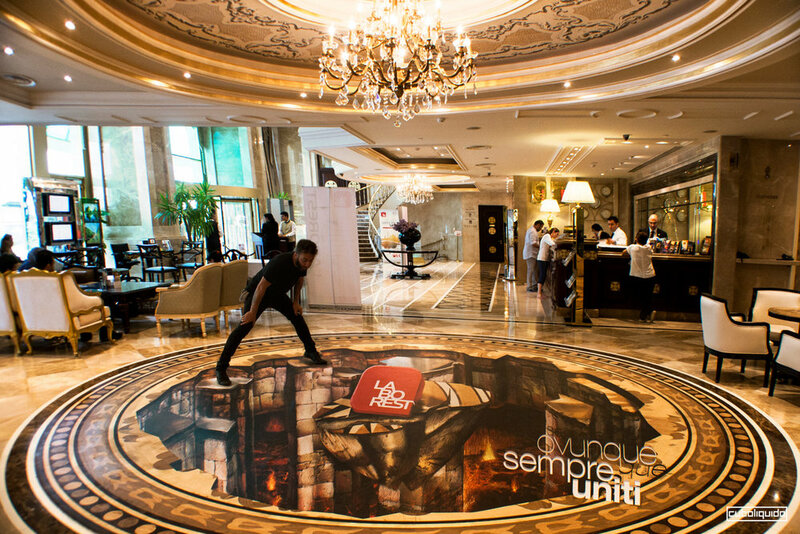 italian and european architects, chose to work out on the anamorphic perspective to value their pavement projects. 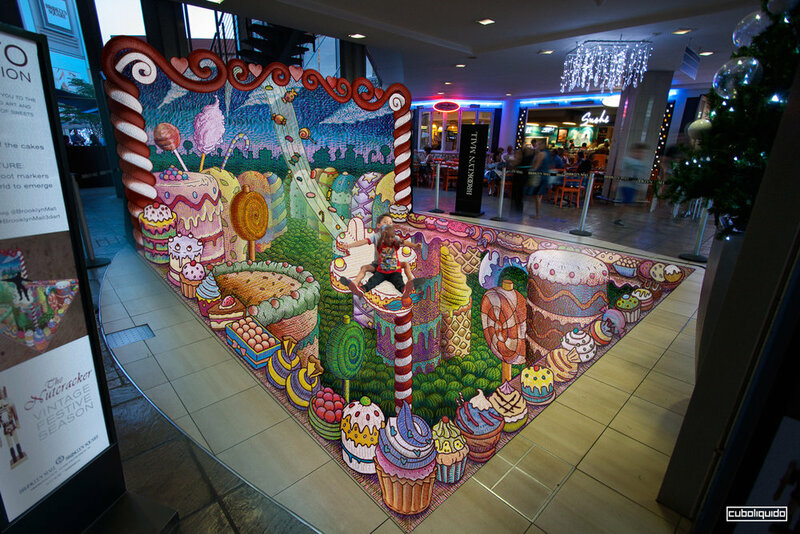 Therefore the 3D chalk art, called 3D street painting too, began to grow out. Usually after the first contact we begin to think to the outline of the project. After, if we could we go to the location to take a survey and to have a precise idea of the surrounding. Then we give an extimation of the timing and we size up costs, artistic talents and materials needed. It’s very important to have a dialogue with the customers to have step by step a feedback from them. That exchange of ideas is basic and have to be constantly developed. At that purpose we send sketchs, planes, images and videos. 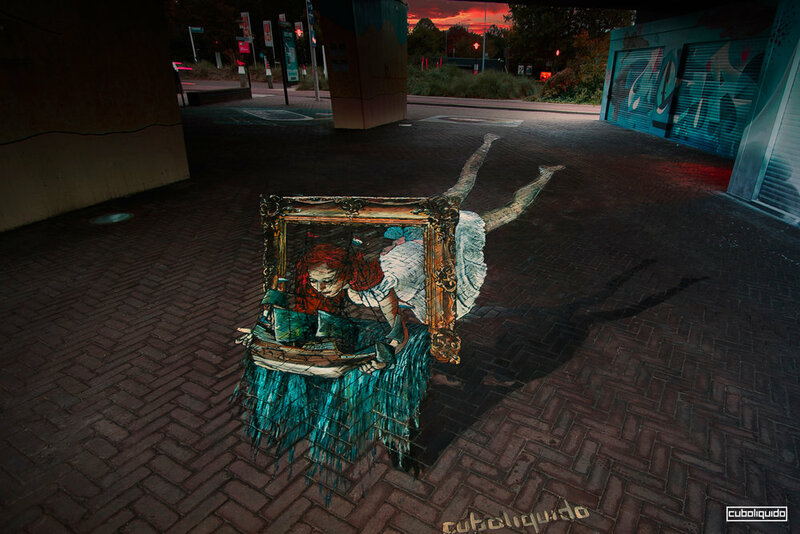 The required subjects will be reinvented following the amazing 3D anamorphic perspective. This tecnique allows to make deeper and dynamic the selected theme and to assimilate the draw in the surrounding. 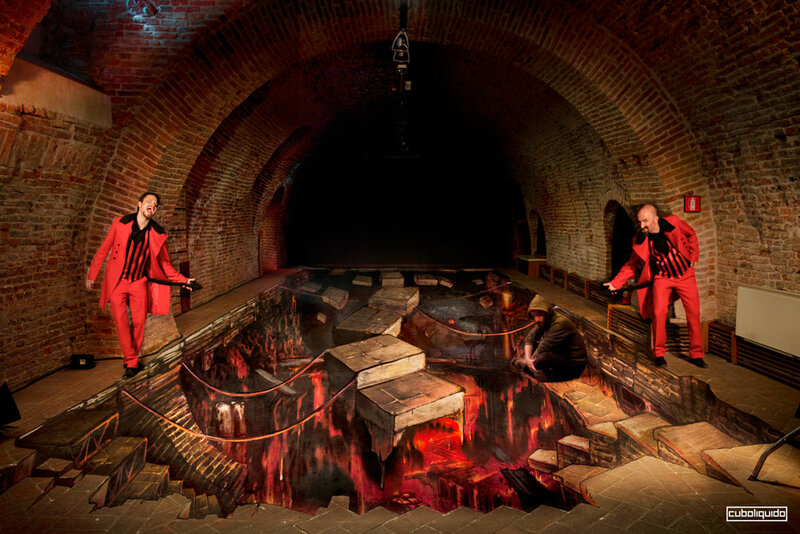 That illusion also brings the viewer into the created 3D world. The purpose of the work and the creating process too will be planned as you suggest in your briefing. However we must consider the location and the condition related to the fair and the size of the stand dedicated to our intervent. These materials represent the real work tools for madonnari and the instruments from witch the anamorphic experiences moved too. They are quick and allow to work on fine details. Unfortunately the are ephemeral so you cannot keep them if it rains. Sometimes you could print the projected artwork on medium or big canvas. In that way you could install the piece in different location without working on. The artist creates the anamorphic piece in a scale drawing and after printing could place the canva in the right position on the base of the point of view. Another possibility is use pigments mixed with water and binder, or tempera and lattex. You can put the color through brushes, paint rollers or spry guns and painting on every kind of surface (asphalt, canvas, wood, cement). This tecnique is often used to work on big surfaces or if you must keep or transport the piece away to finalize it or retouch it with pastels. Another striking chance is to animate the vision of the 3D piece providing to the artwork the 4 dimension effect. It also leds more messages and evolutions according as the idea of the client. To do that the artist creates an animation video that will be projected over the artwork following the method of video mapping. That process could be completed by a sound design poject and synch. These possibilities of projections depend obviusly on the illumination. In the prospective with a point of view as you can find in the teather set design, in the trompe l'oeil and in the vertical illusions. It’s a wide-angle lens with a diameter of about cm 10 put on a tripod of about cm 1,70. 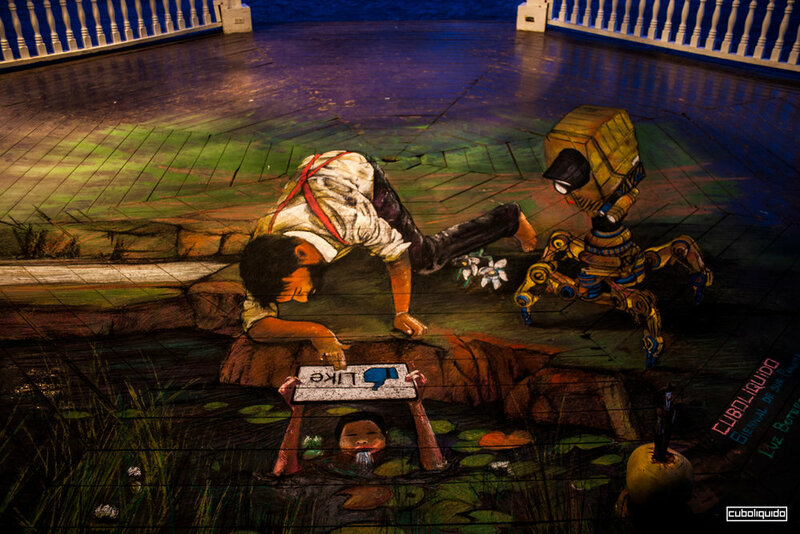 The lens must be at a particular distance from the piece and it’s often used in the street art performances. The flaw is that only one person by one could see across the lens. - remotaggio manuale o con telecomando per scatti dedicati alla photo opportunity?? The video view coud be get through a DSR camera, GoPro or a videocamera with a wide-angle lens. If you also have a mixer video you have the opportunity to have the complete performance time lapse.